When you're a beginner, don't expect that by dabbing your paintbrush at the canvas, you will create beautiful clouds or whitewash (for example). There are specific patterns and shapes that need to be created that won’t be successfully done by dabbing. Think a soft touch and with the above examples, a gentle cross-hatch technique works really well. Wildlife Artist and Conservationist, generous soul Chuck shares his life with us in our exclusive interview. To find out more about Chuck click here! You'll find some great info on brush technique with our webpage chock full of info! Click to brush up on your brush technique. 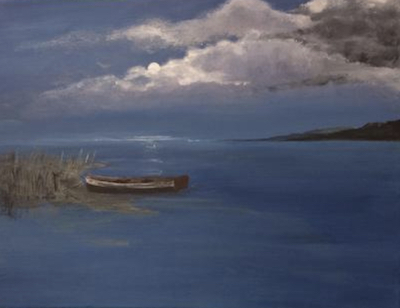 This month we're featuring Laurie Hoifeldt, from Iowa, USA, with her painting titled "Moon Boat". A beautiful moody piece using some gorgeous compositional technique. Thanks so much for sharing Laurie! Click here to read Laurie's story about her "Moon Boat"
Julia's amazing stipple work is right here. Looking for some inspiration? Check out these sketchbooks and make no more excuses! A great idea for great ideas. 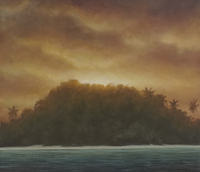 This month's short and sweet story and image comes from talented artist and friend, Fran Hall. 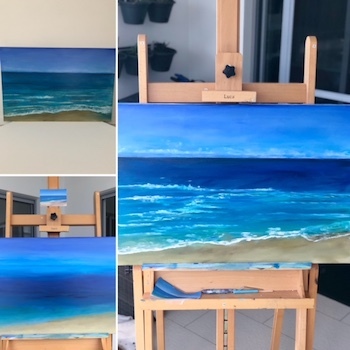 "I’m finding my way back to painting and I am drawn to colour, the sky and water. 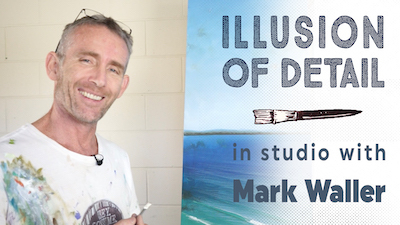 Having followed Acrylic Anonymous and enjoyed Mark’s generosity when it comes to him sharing his knowledge and skills for a while, I recently had the good fortune to be able to attend a weekend workshop with Mark and Frankie. This is a piece I have been working on since then (in between my day job), trying to practice some of what I have learnt. One of the many things I took away from that weekend was how to really look at the colours in the sky, the horizon, the water and the sand. I work in Acrylics and this piece is a real WIP. It is practice, practise, practice. So far I have about five layers on here and I’m not done yet. I can’t believe how much of a challenge it can be to paint a horizon! It was driving me crazy. Finally, after many days I realised that whilst my easel looked straight it wasn’t level. Why it took me so long to work this out I really don’t know. Finally I’m happy with the horizon, clouds, sky and sand I will go back and work some more on those pesky waves. I love the process of creating - and I have a long way to go - but this is fun!" Thanks so much Fran for sharing with us! To check out Fran's instagram, click here.